Moreover, in the area of water quality conservation, the important “polluter pays principle” has disappeared. It has been replaced with “incentives” for effluent treatment and for reuse of water. While reclaiming wastewater is necessary to bridge the water deficit, in the absence of strong regulations to limit polluting activities, such incentives to polluters (to treat effluents), might work as a perverse incentive to pollute more. These are also opportunities for some of the worst water polluters to profiteer: companies such as Dow Chemicals are developing patented water purification technology. If these policies are unlikely to protect the basic right to water, it begs the question: who are the advocates and beneficiaries of these policies? It is likely that a recent report, “National Water Resources Framework Study: Roadmaps for Reforms,” might have had some influence on this draft NWP. There are striking convergences between sections of this report and parts of the draft water policy. This report, by the Council on Energy, Environment and Water (CEEW), was commissioned at the request of the Planning Commission of India to the 2030 Water Resources Group (WRG), via the International Finance Corporation. The report was commissioned even while several Planning Commission constituted working groups were preparing reports on various aspects of water governance. The CEEW is one of the main Indian partners of the WRG, a high profile public-private partnership housed in the International Finance Corporation (of the World Bank Group). Financed by multilateral banks and bilateral aid organisations among others, the WRG’s strategic partners include the multinational firms Cargill, Coca Cola, Pepsi, Unilever and McKinsey & Company. The WRG is systematically trying to influence how the world’s water will be allocated in future. It is seeking to influence the water policy in India, South Africa, Mexico, Jordan, China and Mongolia, where it is targeting public officials in water and environmental ministries. For India its targets were more ambitious: the states of Karnataka and Maharashtra, and “potentially the National Planning Commission.” In their efforts to make inroads into national and regional policy making arenas, they seem fairly successful. For example, in India, since 2010, the WRG has successfully been collaborating with the Confederation of Indian Industry and the CEEW to influence water policy in Karnataka, and now it appears, at the Centre. The WRG is particularly interested in influencing agricultural policies, especially crop choices and agricultural water allocation in the countries they target. The reason for its focus on a “water-efficient,” “productivity-oriented” agriculture, and the importance they place on the role of food value-chain players is self-evident: the WRG is led by the transnational agriculture and food related businesses that constitute its main members. However, such water sector reforms will become yet another way to push already vulnerable peasant agriculturists further into poverty. Civil society groups in Karnataka are aware of and oppose the dangerous path their State is tempted to take. In many ways the draft national water policy epitomises not only what is being advocated in the area of water governance, but also the problems with the initiatives being pursued around the world. Multinationals are no longer content with profiteering from their traditional areas of businesses: they want to play a larger role in the allocation of the world’s natural resources, which have so far been in the public realm. The actual water users and their representatives are marginalised. In the context of the climate crisis that the draft policy seeks to address, it is important to remember that a large number of water users, farmers and local communities have been taking prudent decisions in the area of effective water management and adaptation. There is substantial practical knowledge that they can bring to the table that would completely change the way to look at issues. Rules governing the use of water, an essential part of life itself, must be the result of careful consultation with all stakeholders, especially the least powerful, and should not be driven by corporations and international finance. 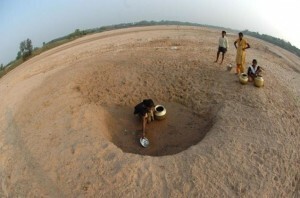 This is important not only in India, but for what it could mean for the future of water governance globally.